Whether you start a fire with matches, a lighter or sticks or stones, fire has been central to our lives since man figured out how to use it over 700,000 years ago. Once man discovered fire, he was then seized with a desire to master it!. Eventually, man realized that by concentrating fire in a hole in the ground he could control the spread of it more effectively and could also maintain greater heat output. 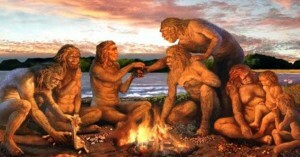 Man’s first use of a fire pit dates back to the Mid-Paleolithic Period, some 200,000 to 400,000 years ago. Archeological evidence from sites such as the Tabun Cave at Mt. Carmel in Israel and the Klaises River Caves in South Africa shows that fire pits were made using a collection of stones to contain the fire and to keep it from spreading. Other cultures used a simple hole in the ground filled with hot coals and stones for both warmth and in-ground cooking. Peruvians, Eastern Indians and many Polynesian tribes used in-ground pits to cook for large numbers of people during harvest and festival times as well as for religious ceremonies. 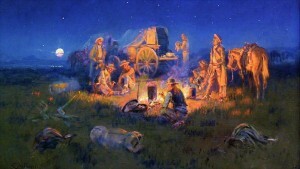 Fast forward to the frontier days of the “Wild Wild West” in the USA; Native Americans used fire pits for heating, cooking and also as a ceremonial focal point during tribal councils. As settlers from the eastern US moved west, they adopted the use of the Native American fire pit for their own heating and cooking needs. 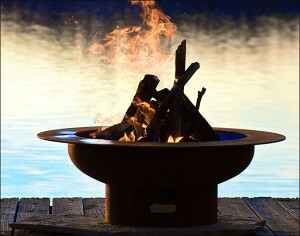 The construction of fire pits has changed a great deal over the years. As man learned to work with metals, in-ground heating and cooking moved above ground. 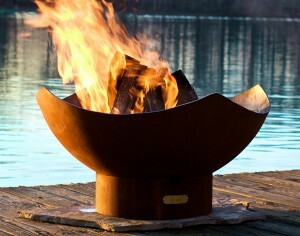 Different styles of fire pits emerged as different cultures found new ways to shape and form metal. Beachcomber. 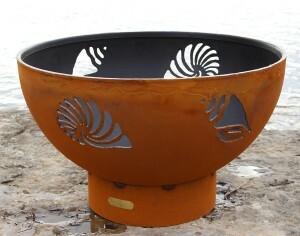 Constructed of ¼” American carbon steel, Conch, Nautilus and Scallop sea shells, our Beachcomber Fire pit will remind you of endless summers by the sea. Its design complements both seaside and land-side locales! Barefoot Beach. 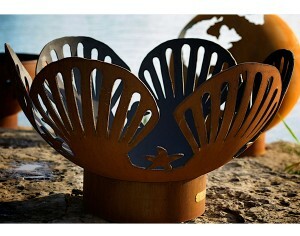 Classic seashell design brings the beach to your backyard. This fire pit is perfect for residential use, but it is also a great choice for commercial use on your company’s campus or in a park. Made In The USA, constructed of high strength American carbon steel. Fleur De Lis. 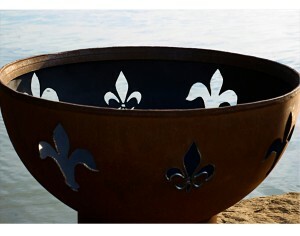 Translated to mean “flower of the lily,” our Fleur De Lis fire pit is both graceful and stylish, an elegant combination of function and form. 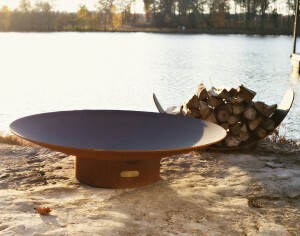 Constructed of American carbon steel, this fire pit is perfect for either residential or commercial use. 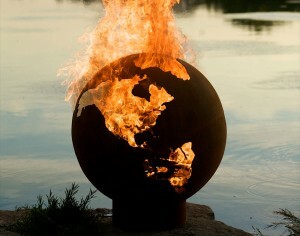 Fire pits are so beautiful and even better, extend your outdoor season immeasurably. There is absolutely nothing better than sitting around the fire pit with family and friends (while perhaps enjoying a few cold weather libations!) as the cool fall months come along. It’s time to get fired up now!